Exercise is crucial to maintaining your dog’s health. According to the Association for Pet Obesity Prevention, over 50% of dogs in the United States are overweight or obese! This can cause heart conditions, skin conditions and even shorten his or her life span. Therefore, making exercise a priority is essential for your dog’s health. Not to mention, if your dog does not get enough exercise, it can lead to behavior problems. Anyone else missing a designer shoe?! This truly depends on your dog’s breed, size, health and age. But as a rule of thumb, your dog needs 30 minutes to 2 hours of physical activity per day. You can easily achieve this with a daily 30 minute walk. Please take into consideration your dog’s age and health as you may need to modify this practice. For instance, due to Gatsby’s back problems, I break up his walk into one 15-minute segment in the morning and another 15-minute segment in the afternoon. In-door and Outdoor Obstacle Courses: Create tunnels with couch cushions or blankets, include furniture that your dog has to jump over or crawl under. Be sure to lead your dog through it so he or she understands what you want him or her to do. You can also create a course in your backyard or local park (benches and tables work wonders). But always end it with a treat! Treat Hide-and-Seek: Hide your dog’s favorite treats around the house – in the couch cushions, in different rooms, behind doors, under tables, underneath rugs, etc. This will not only work your pup out mentally and physically, but he or she will have loads of fun too. Just be sure to remember where you hid the treats! Dogs are excellent motivators because they encourage you to be more active. Studies show that caring for a pup improves your physical and mental health. 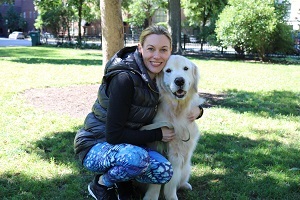 Not to mention, exercise can be a lot less work and a lot more fun when you are doing it with your doggy. Gradually increase the lengths of your walks. Slowly build your time until you and your dog are walking at least 30 minutes, two times a day. You can easily track your progress with your smartphone on applications like Map My Walk and Steps Pedometer & Step Counter Activity Tracker. Pick up the pace. Invest in a heart rate monitor (i.e. Fitbit) and stay at your target heart rate throughout your walk. You can also find a spot to run or walk the stairs with your pup to get a boost (and mini-dress legs). Just remember to warm-up prior with a leisurely walk and cool-down at the end of your session. Finding a park bench to do 15-20 steps ups, 15-20 push-ups and 15-20 triceps dips. Work your way to three sets. Bringing an exercise band on your walk. Stop three times to do 15-20 squats, 12-15 reps of bicep curls and 12-15 reps of triceps curls. Make it social. Get a group of your friends and their dogs together and hit the trails for a great workout with lots of laughs to be shared along the way. Plant an organic garden. Gardening is great exercise and you can plant vegetables that are helpful in managing you and your dog’s weight like kale, spinach, carrots, broccoli, cucumbers, celery and bell peppers. Make it a habit. Remember you need to stay active every day which is why rocking it out with your pup makes such perfect sense. Your buddy needs to get his physical activity in too so when you do it as a team it becomes a lifestyle. Start simple, without putting pressure on yourself or your dog, and you will find that you are both looking forward to this happy time of the day — every day. 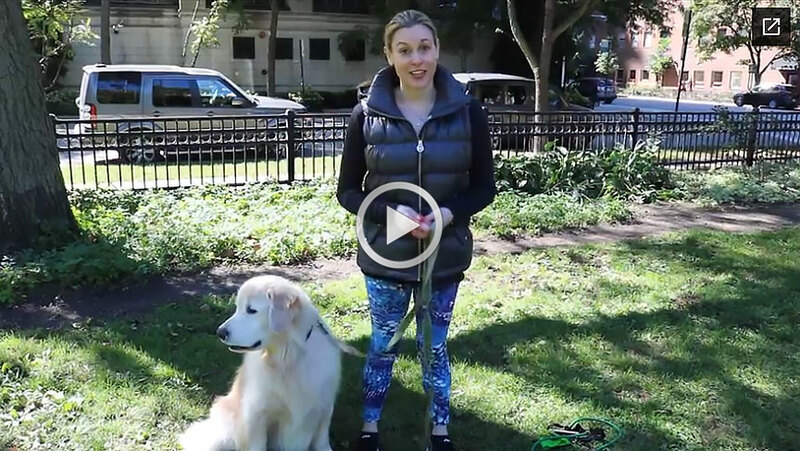 Share a photo of you exercising with your dog in our private Facebook group. Click here to request access.